Organize the photos in your albums by date, upload date, alphabetical by title, or drop-and-drag to a custom arrangement. Just tap the OrganizeÂ command on the left and chooseÂ Sort Album. 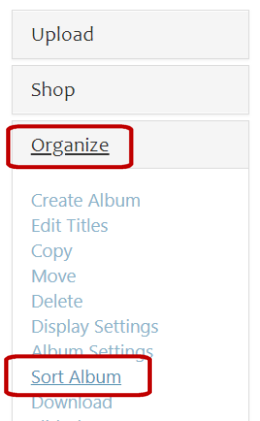 To drag photos to a new order, chooseÂ Manual Drag and Drop RearrangeÂ after Sort Albums.